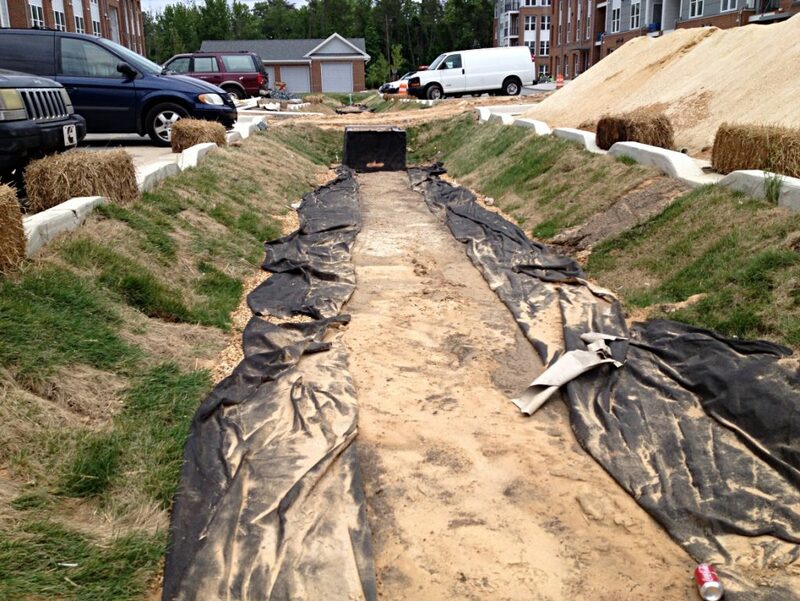 ENVIRONMENTAL SITE DESIGN: PITFALLS AND LESSONS LEARNED (SO FAR…) | Geo-Technology Associates, Inc.
Association’s (MBIA’s) Build Maryland, Sept/Oct 2017 magazine. Written by: Ben Dinsmore, P.E. Whatever happened to those big stormwater management ponds that used to be constructed in every development? Since 2010, those large facilities have been gradually phased out of new developments in favor of smaller-scale, and non-structural facilities known as Environmental Site Design (ESD) devices. 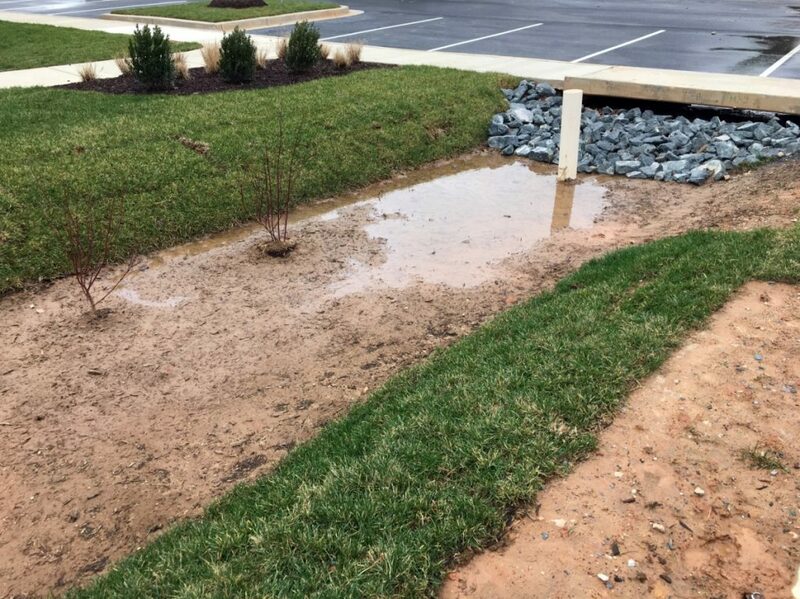 This change is the result of efforts by the Maryland Department of the Environment (MDE) to control stormwater runoff from new developments. Any development that did not receive stormwater management (SWM) plan approval prior to the May 4, 2010 deadline must be designed using ESD facilities to the Maximum Extent Practicable, thus the advent of the phrase “ESD to the MEP.” The goal of this change was to refocus SWM design to mimic the natural runoff characteristics of the site, as opposed to the “old” method of collection and long-term storage of rainwater in larger-scale ponds or infiltration systems. Common ESD devices include micro-bioretention facilities, bio-swales, rain gardens, dry wells, submerged gravel wetlands, and pervious pavements. These facilities may incorporate infiltration techniques, if feasible based on the soil conditions. Otherwise, they will include underdrains. It is the opinion of many designers, engineers, and developers that the ESD facilities are flawed and the use of these facilities may create more harm than good in the future. One reason for these concerns is that the function of these devices is highly dependent upon proper design and construction. Minor deficiencies in either can result in clogging, saturation of the planting media, and overflowing or failure of the facility. We have observed situations in which excessive proportions of fines (silts and clays) in the planting media, a layer of sediment at the invert of the facility, or overly compacted subgrade soils have impeded drainage in the facility. A recently-constructed micro-bioretention facility which is holding water due to clogging and saturation of the planting media. It was determined that the proportions of the silt and clay within the planting media were at or just above the specified ranges. A micro-bioretention facility in which the planting media has been clogged by runoff from nearby stockpiles and exposed subgrade prior to paving. A related concern is that even properly designed and constructed facilities require more maintenance than the old SWM ponds and the construction of so many facilities on large developments will create the need for significant maintenance in the future (maintenance that could be the responsibility of private homeowners and could be relatively invasive or costly). Property owners, HOAs, and private residents are not necessarily prepared to handle (or will not know how to perform) this maintenance. This could result in the failure of many of these facilities and significant maintenance costs. ESD facilities that don’t function properly would likely result in the creation of “swampy” areas, which could draw mosquitos and create perched water pockets. Retain a qualified geotechnical engineer to perform a proper evaluation of the subsurface conditions. Many design professionals and County agencies have interpreted the MDE requirements for quantity or locations of explorations differently. In reality, the boring locations should be recommended by the geotechnical engineer based on site geology and other site-specific issues. It is a good idea to run the proposed scope by the appropriate County reviewer to verify compliance with the County’s interpretation of the requirements. If infiltration techniques are being considered, in-situ infiltration testing should be performed and supplemented by laboratory testing as appropriate. The project designer should understand geotechnical recommendations and other site constraints and incorporate them into the facility design. The function and design of many systems, particularly pervious pavements, are poorly understood or implemented by many designers. Each type of facility has different design constraints and the ESD device selection is highly dependent on the subsurface conditions, such as soil types and depth to water. It may also be appropriate to modify or augment the standard details by adding underdrains or revising the inflow or outflow features based on site-specific constraints. Details of each proposed facility should be clearly depicted on the plans and all materials to be used, as well as maintenance requirements, should be clearly specified. Proper construction sequencing is important to avoid problems. If planting media is placed prior to construction of adjacent pavements, sediment in the runoff from surrounding soils can clog the media. Furthermore, the construction of houses and nearby ESD facilities should be coordinated such that the construction of footings doesn’t impact a previously-constructed facility, or the construction of a facility will not undermine a previously built footing. Design of adjacent retaining walls should also take into account the fact that excavations will periodically be required in the ESD facility for maintenance. A qualified engineer (ideally, the geotechnical engineer that performed the subsurface evaluation) should be on-site to observe the construction and test the materials being used in the ESD facilities. The gradation of the planting media should be carefully evaluated prior to placement. We recommend that the silt and clay content of this material should be maintained at the lower end of the accepted range to minimize the likelihood of clogging. Also, the contractor should be sure to remove any sediment remaining in the facility excavation prior to construction and should be careful to avoid excessive compaction of the facility subgrade. The on-site geotechnical engineer should evaluate the subgrade prior to construction and, if overly compacted, should recommend that the contractor tills or aerates it prior to construction. Of course, the potential for headaches and cost overruns can be reduced by retaining qualified civil and geotechnical engineering consultants to work together to perform an appropriate SWM facility design. 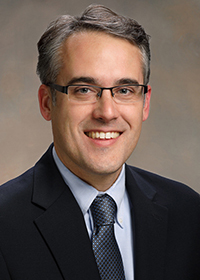 Ben Dinsmore, P.E., is an Associate with GTA and has 19 years of geotechnical and site engineering consulting services, primarily in the Baltimore – Washington, D.C. corridor.